New-gen devices rock transition and recurrency training. 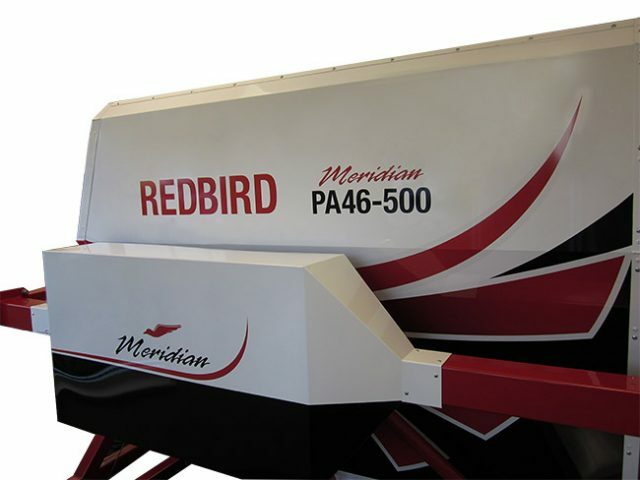 Unlike many training devices, the Redbird simulator is a knob-for-knob replica of the original. We had departed Runway 34 at Westchester County Airport (HPN) for a cruise down the Hudson and were abeam midtown Manhattan at 3,500 feet when the Piper Mirage’s Lycoming TIO-540-AE2A began sputtering and the prop froze upright in the windscreen. In the right seat, Bill Inglis, with more time in these cockpits than just about anyone on the planet, punched up the “nearest” list on the G1000, and I banked hard left toward JFK, trimming for best glidespeed on my way through the emergency checklist. Spoiler: No need to pucker. We were in a flight simulator. Not much novelty in using a ground-based device as an alternative or adjunct to training in an actual aircraft. But what provoked a startled reflex as much as the sudden simulated emergency and the Empire State Building’s spire growing larger in the windscreen was the new era of full-motion Aircraft Specific Model (ASM) training devices this machine represented—and the increased safety and lower costs it could bring to GA, where ASM realism like this has never before been available at any price. Paradoxically, “You can do training procedures much more realistically” in this type of simulator—designated by the FAA as an Advanced Aviation Training Device (AATD)—“than in a real aircraft,” Inglis, founder and president of Legacy Flight Training, had told me during our “preflight.” We were in a furniture-less room housing the Redbird Piper Mirage (piston) and a Redbird Piper PA-46 Meridian/M500 (turboprop) simulator at the company’s training center, co-located with Piper Aircraft in Vero Beach, Florida. For example, you can practice an emergency descent, which is almost never done in a real aircraft to avoid “dumping cabin pressure and shock-cooling the engine in somebody’s brand-new Mirage,” Inglis says. And whereas “most simulators just put you on the runway, these really help you land with a crosswind—and with unusual attitudes and recovery,” he adds. The full-motion simulator for the Piper Meridian. In another setting, this would be disruptive technology, but there’s no equivalent training to disrupt. 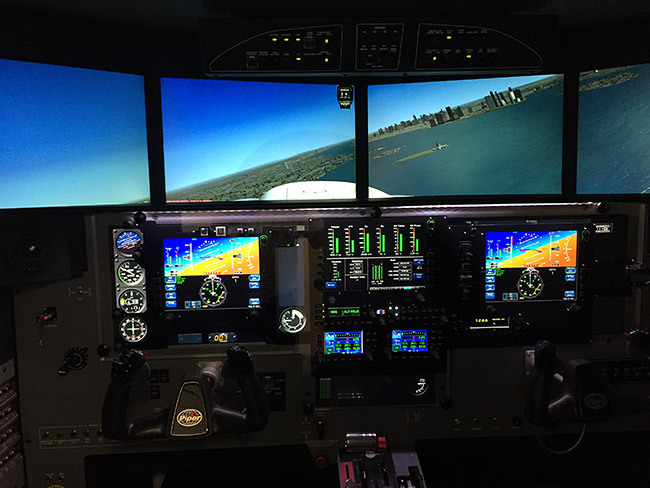 Instead, these devices can create a parallel universe to the CAEs and FlightSafetys where commercial pilots train, enabling independent FBOs and flight schools to offer analogous, but more personalized sim training at a GA-friendly price point. To be sure, some GA pilots—particularly, turbine and turboprop owners—train at such commercial facilities, but most have had no access to sims of this caliber or an alternative to using an aircraft for approved training. 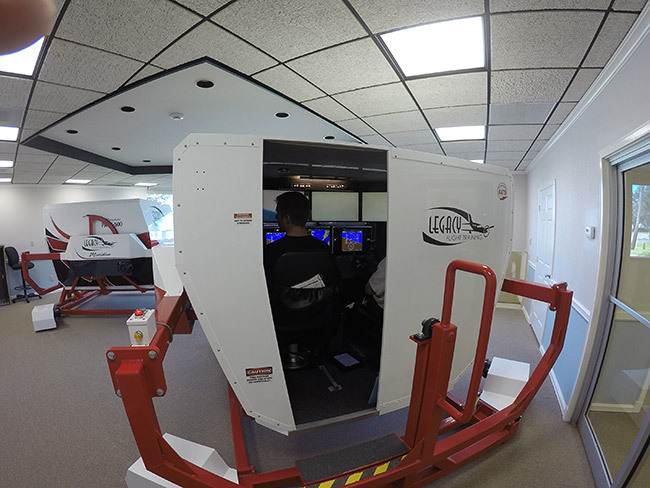 Legacy Flight Training in Vero Beach, Florida, makes use of two full-motion simulators, a Piper Mirage and a Meridian, as part of its multi-platform training approach. The simulator/airplane mix not only improves the quality of training, but cuts down on cost substantially. 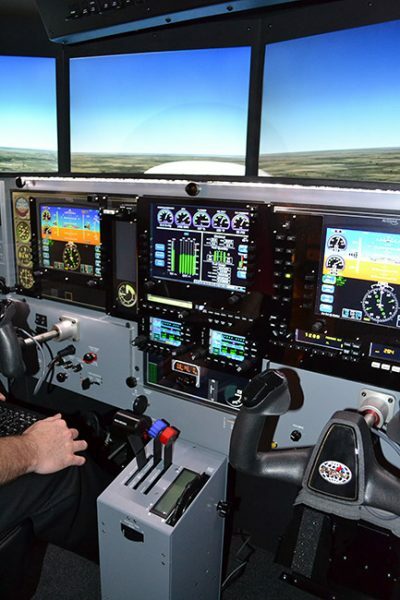 Surely scoring equally high on the benefits list among many pilots, these simulators “give people options for driving down the costs of recurrent or type-specific training,” says Todd Willinger, CEO of Redbird Flight, the AATDs’ manufacturer. 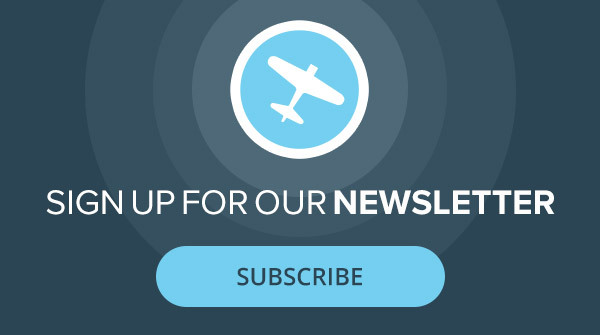 The Texas-based company was founded last decade to “democratize training devices for general aviation,” according to Willinger, and these ASMs are a major advance in that goal. 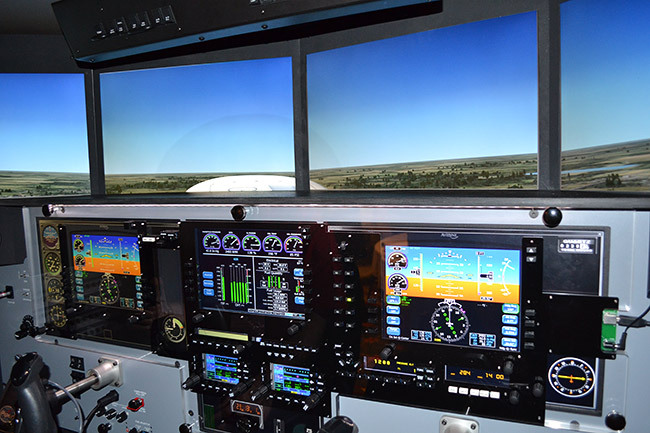 TOP: Pilots benefit from being able to fly realistic scenarios, especially those that would be ill-advised or impossible in an actual airplane, as well as being able to fly with a variety of panels. ABOVE: The Avidyne Entegra panel in a Redbird FMX is one of several panel options employed by Piper over the years on its PA-46 lineup. Inglis, a flight training careerist, had heard the name Redbird, but called the company only on the recommendation of a customer who owned a Meridian, Piper’s flagship turboprop single, wondering about the possibility of using a simulator for recurrency training. That was in 2010. Redbird’s FMX AATD, with its interchangeable cockpits for piston singles and twins and proprietary motion technology, was making inroads into training facilities, but the company produced no ASM device. The day after his phone call, Inglis flew to Redbird headquarters in Austin to begin planning a customized Piper Mirage and Meridian ASM with Redbird founder, owner and chairman Jerry Gregoire. In truth, “model-specific” is somewhat of an amorphous designation for these PA-46s, and that’s what intrigued Inglis most. “All the Mirages and Meridians went through so many avionics changes,” he says, referring to the Avidyne, Meggitt, King and Garmin equipment and differing autopilots their panels variously hosted. Inglis’ customers own examples of almost all. “When I saw that they could change out the panels, I was sold,” he says. The panel switch-out takes about three minutes. The Mirage AATD was delivered in 2011. The boxlike device is about the height, width and length of the forward section of a PA-46, mounted within a lateral frame girdling its midsection, with entry through a rear portal. The instructor can control the sim with a laptop or tablet. The six wraparound monitors beyond the windscreen reproduce the real world with more than enough fidelity for visceral engagement, and the 50 degrees of total pitch, 60 degrees of yaw and 40 degrees of roll motion can be spiked with turbulence and other adverse conditions. For those who have flown only static sims, the difference in the training experience can be profound. When Connecticut resident Randy Bonnist moved up from a Mirage to a Meridian in 2004, ground training was provided on a static device. “It was an extremely difficult transition,” he says. Recurrency training did little to bolster his confidence. But “the full-motion simulator changed flying completely,” Bonnist adds. “I can’t understand any pilot who doesn’t spend time in the sim. I was able to practice emergencies you really could never do in a stationary simulator—spins, icing, you can configure the flaps for various types of water landings,” he continues, recalling his last visit to the training center in early spring. “We’d set up the simulator to fly between layers, and it started snowing and got windy, and we picked up ice. Then when we were flying back north from Florida, [the weather] did exactly the same thing.” Bonnist credits the session with keeping him calm, prepared and safe. Somers sought an ASM sim solution for his Bay Area flight school when he considered adding a Mustang to his fleet of Diamond DA40 and DA42 single and twin pistons, sensing a demand from local owners of high-performance aircraft for access to a light jet. When Redbird started making full-motion sims, it was for simple airplanes. Today, much of the business the company does is making full-motion simulators for turbine aircraft. Two of its most popular models are the Cessna Mustang and the CitationJet. Angel City Flyers also offers an insurance-approved Citation Mustang CE510/CE510S training course that includes 15 hours of simulator time and five to 10 hours of aircraft flight time for $13,500. 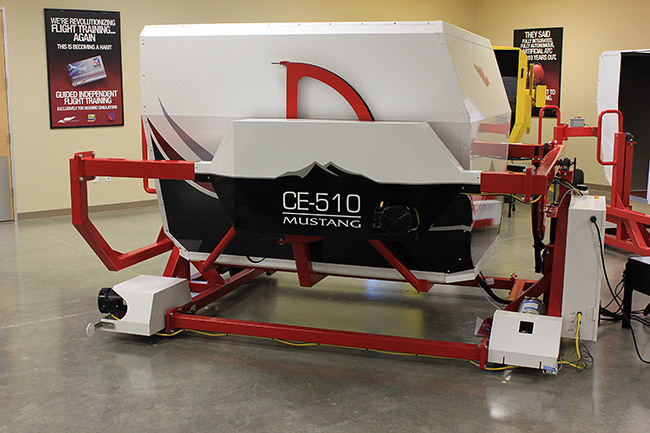 For cost comparison, the Mustang rents for $1,200 per hour (dry) and the instructor is $500 per half-day; the simulator is $450 per hour dual. To be sure, AATDs aren’t intended to replace commercial-style Full Flight Simulators (FFSs), like the bulbous Level D devices perched on stalks that allow pilots to qualify for a type rating in a transport category aircraft without ever having stepped into the cockpit of a real one. AATDs and Basic Aviation Training Devices (BATDs) are held and built to less rigid technical standards than Level 4-7 Flight Training Devices (FTDs) and Level A-D FFSs (AC61-136A and Part 60, respectively). “This device is not an airplane, but each has a training purpose,” Inglis stresses of his Redbirds. A simulator doesn’t fly like an airplane, and flying a GA aircraft isn’t a procedures-based operation like commanding a transport category airplane, either. But for making the most of training time in the real thing, “This can definitely get people very well prepared,” Inglis says. The cockpit of the Cessna Citation Mustang is all business, with the look and feel of the real McCoy. Companies like Angel City Flyers use the Mustang flight-training device to simulate failures and in the process greatly reduce the amount of time, and dollars, prospective PICs spend in the actual airplane. Though higher-level devices, compared to an ATTD, allow trainees tolog more hours of sim time toward various ratings and recurrencies, that comes at the cost of conducting annual equipment accuracy audits and keeping engineers on duty to operate these commercial systems. Conversely, if a Redbird sim has a problem, techs at the company contact it over the Internet and fix it remotely. “I’ve never had a mechanical breakdown,” Inglis says. As a cost comparison, Redbird’s PA-46 and Mustang AATDs cost a little more than $200,000. 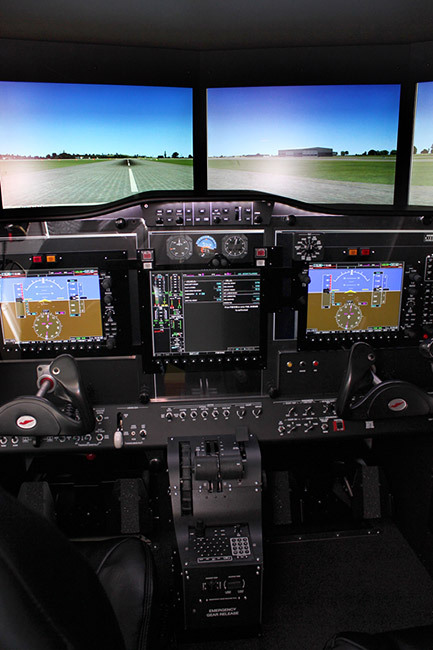 Simulator manufacturer Frasca International, which concentrates on the commercial training market, offers a Cessna C172 Level 6 FTD without motion for $350,000 to $400,000, and a Cessna Citation Mustang 8457 Level 5 FTD simulator for $800,000 to $1.2 million, depending on options, according to Randy Gawenda, Frasca’s Business Development manager and longtime training professional. Likewise, cockpit hardware—as in knobs and switches—are mostly generic, saving costs on parts and potential downtime should an OEM run out of spares. But Redbird recognizes some customers may be willing to pay for increased verisimilitude in their training, and is considering offering AATDs with real avionics and OEM finishing touches installed. These future plans are all well and fine, but meanwhile, I was gliding silently over midtown Manhattan, the Empire State Building now blossoming in the windscreen. “Oh,” Inglis said, nonplussed, looking at the power quadrant. “Someone pulled back the mixture.” He advanced the red lever and the prop resumed its comforting blur, the engine resurrected. “How’d you like to fly the Sully approach into the Hudson?” he asked. What pilot—particularly, a Manhattan resident—could resist? Inglis stopped the aircraft in midair, tapped some commands into his iPad, and in a few moments, we were climbing out from LaGuardia as Inglis set me up on a left base for the Hudson River. Spoiler alert: It didn’t work out as well for me as it did for Capt. Sullenberger. Senior Editor James Wynbrandt is a multi-engine, instrument-rated pilot and an award-winning author of books and articles. He flies a Mooney M20K 252.